It’s a Fact! Selling Starts Online. Now, more than ever, you need be where your customers begin their buying process. A large majority of buyers now start their buying process online with product research and information gathering prior to making contact with sales. In today’s competitive environment, you need to stand out from the crowd. While differentiating your business remains a challenge, it should be recognized that today’s buyers use the Internet as their primary source for researching products and services. And, it’s increasingly clear that online sellers who can better educate and inform their customers are the ones that will stand apart. To address this challenge, ProSel Commerce helps you to provide a more efficient, robust information resource for your sales team, and a richer, deeper online experience for your customers. While the sales team understandably may remain the most in-depth source of information regarding your products and services, backing them up with detailed, rich product content will help them make better recommendations and speed up the customer’s decision making process. by enticing and retaining customers with an online shopping experience that offers the products and services they’ll want, in a manner tailored for their unique needs. For business-to-business oriented companies serving diverse customer types, personalization is a key to success online. And it takes a very versatile system to deliver results today, tomorrow and into the future. ProSel Commerce’s independent, open architecture insures that no matter what new requirements come your way over time, the system can be enhanced, extended or integrated without practical limits. Instead of settling for a ‘one-size-fits-all’ shopping cart or catalog approach, the forward-thinking company will recognize the need for flexibility in handling client needs, both current and future. System versatility insures that all client requirements can be met through a single system. And versatility translates into investment protection by insuring you’ll get the most return from your e-commerce efforts. 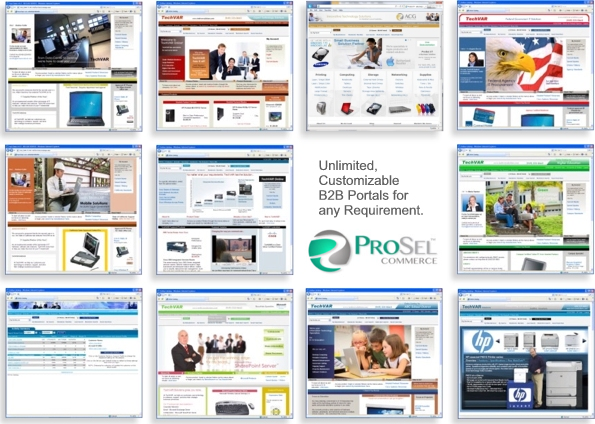 ProSel Commerce delivers superior usability and versatility by giving you the ability to serve up a unique appearance and content that truly reflects your business. And where specific client or market needs dictate, the default appearance can be modified to create an individualized look and feel, with specific site content, as desired. This allows you to respond to the specific needs of the client or opportunity, tailored to maximize the sales potential. 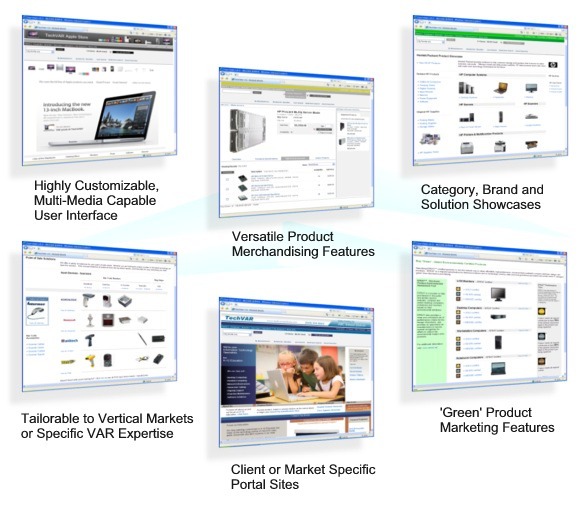 All clients can use the same ProSel Commerce site, or online portal sites can be configured and fully customized to reflect unique client requirements and your own client-specific sales and marketing strategies. 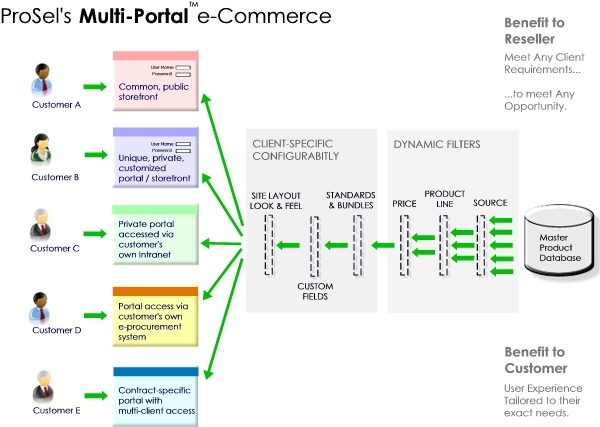 The portals can be accessed from your website, or linked directly to the customer’s own intranet or e-procurement solution allowing them to conduct business with the ultimate of convenience. * - No, or at least not likely included.